The backstory: I was looking for some handlebar tape for my bicycle when I came across some old Ethernet cords I had laying around. I instantly thought I could use them in a cool, creative, and geeky way to wrap by bars. I’m going to briefly go over how to do it yourself, and if you get confused be sure to check out the pictures at the bottom. I started by using an X-acto knife to carefully cut the cable open lengthwise to reveal the twisted colored wires inside--a tedious process, to be sure. There are 8 wires inside twisted together in pairs, I separated them by color, but left the colored pairs twisted around each other (see the photo below). The color of the wire insulation can vary from cable to cable, and looking at the clear cap on the end of the cord can give you an idea of what’s inside. Preparing the handlebars for the multicolor wire is a simple matter of wrapping them in something--preferably something sticky--so the wires stay put. I used some gaffer tape my roommate had onhand, but really anything will work. I folded the tape over lengthwise, essentially making some DIY double-sided tape and then wrapped it around the bars, making sure that I pulled it tight. 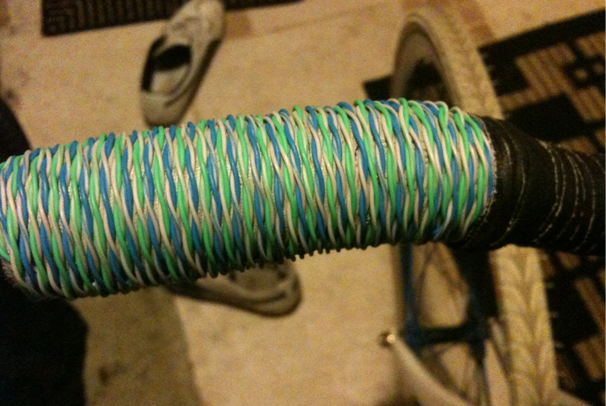 Now that I had a tacky surface to work with, I began to wrap the wire around my handlebars, first making a loop at the opposite end from where I was starting to later secure the loose end of the wire. I chose to wrap mine in a simple spiral, but you can try out any different wraps or weaving techniques you know of. I finished it off by threading the wire through the eyelet I made at the start and tying it off. then wrapped a bit of tape around to make sure it stays put. Done! 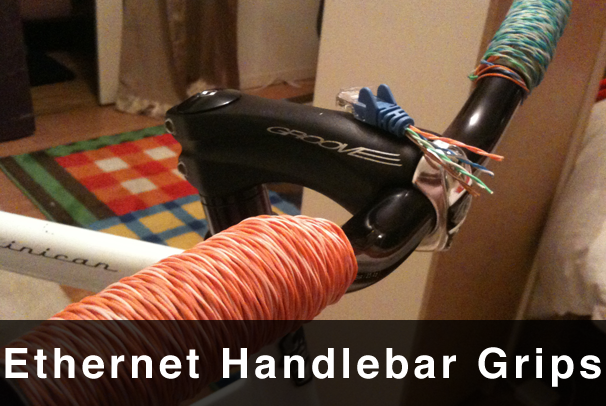 If you’re looking for better shock absorption, try wrapping the handlebars with some cheap bar tape, then place the ethernet wires atop it--the thin layer of gaffer tape doesn’t provide me with much cushioning. That aside, I like the look of the wire wrap a lot and can already see myself trying out different wrapping techniques in the future. You can see below the effect of untwisting the wires for a smoother surface. If you have questions or want to share your own design or one you’ve found, be sure to leave a comment below.